It's a random act of kindness, on behalf of one of Pete's uncles who passed away earlier this month. Jerry was always doing nice things for people, and in fact was so busy doing that over the last couple of years he missed checking to see why he was having all sorts of odd symptoms and pain. His family had him for a little more than two weeks after he finally took the time to find out what was wrong. In lieu of flowers or donations, his children asked for random acts of kindness and this is mine. One thing that Jerry did for me was SO much more huge than he may have known. See, it's a weird thing, but Pete's parents both grew up pretty near the town where I went to high school, so even though I didn't meet Pete until I was in my 20s and old university friends introduced us, I knew quite a few of his relatives for much longer than that. Jerry and another of his brothers and their wonderful wives both lived in that town, and because they were all very active in the same church we went to then, they heard from the parish priest last summer when we were gathering for our own sad burial back there. I was so distraught at the time it never occurred to me to call them, but sure enough - Jerry and his wife and his brother's widow came walking along the curve of the road just as we were gathering around my family's grave. They'd known my parents of course, and they love Pete, but I knew they were there for me. And it helped a lot to have them there - I had no idea how much it would then and still does today. 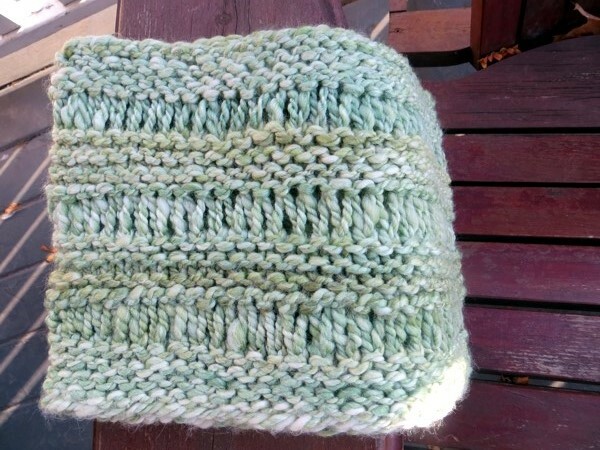 So when I very randomly got the idea to knit a cowl for somebody who's having a sad time, and found out a few hours later that Jerry had died, I knew this was something I was doing for him as much as for my friend. 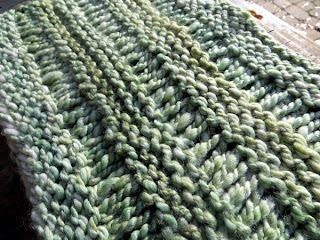 The yarn is handspun made from a gorgeous bamboo blend I bought at the Kitchener-Waterloo Knitter's Fair a couple of years ago. I chose it for the colour, and the softness, and the renewable aspects of bamboo that just feel special to me. Plus, obviously, the fact that I'd spun it myself, which seems important in a situation like this. 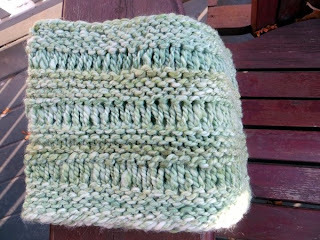 As always: it looks so great in drop stitch. 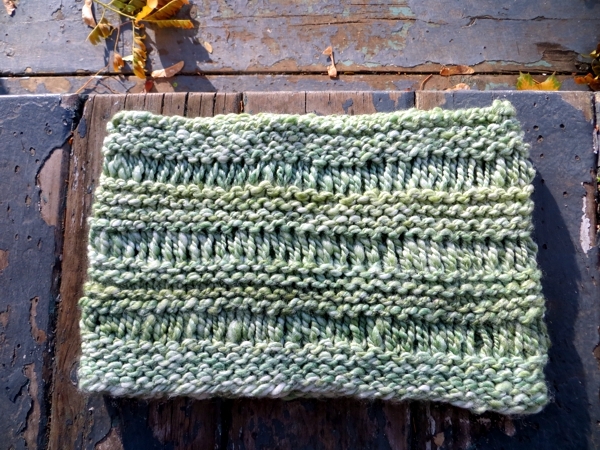 It was incongruously cheerful to knit, and I love the way it came out, and I think Leslie liked it, so - in all, a good demonstration of the power of knitting. I hope you're able to use your knitting for good today, even if it seems as small as just feeling nice in your hands! 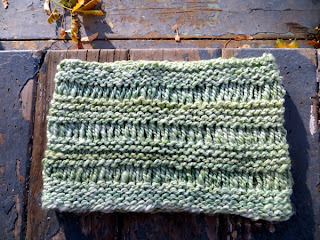 And as the recipient of your random acts of knitting, I can say that it helps indeed to know that people are thinking of us during this time and sending us generous and loving thoughts. Thanks again! You are VERY welcome Leslie :^) I've been there too, and I'm grateful there was some little thing I could do for you. What a beautiful story, and a beautiful cowl.